It's time for another Color Throwdown! Jodi is our hostess this week with a pretty color combination--gray, teal, and pink. I paired the colors with the current sketch at Sunday Stamps. I made a simple scene with a scooter from the new Scooter Balloons set from Lil' Inker Designs as a focal image. The scooter and balloons were colored with Copic markers, then cut out with my Scan 'n Cut. I adhered the images to a background I created with some distress inks and a cloud stencil. A strip of gray cardstock was adhered to the bottom of the panel to form a "road" and ground the image. No need for a sentiment since the balloons already took card of that for me! After matting the image panel on coordinating teal cardstock, I adhered it to a gray cardstock panel on an angle. The layered panel was positioned over a pink stitched rectangle at the center of a pink dotted patterned paper panel. 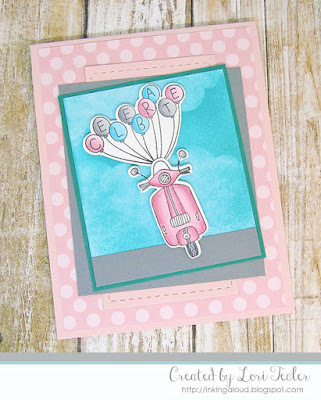 After trying out contrasting gray and teal card bases, I ended up going with a simple matchy-matchy pink card base to finish the card. To play along, just create a paper crafted project using these colors as a starting point and add a direct link to your finished project using the linky tool found at the end of this week's CTD post. As always, if you don’t have exact color matches, something close works just fine. Just be sure that the challenge colors are the dominant ones in your project. 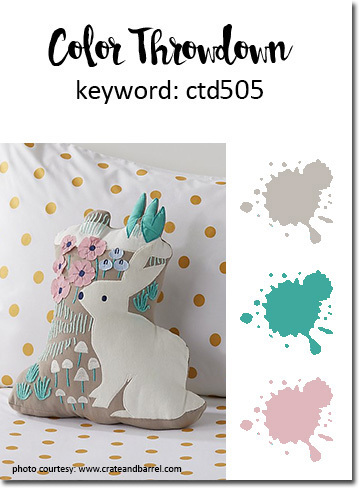 And, if you upload your project to an online gallery, use the keyword CTD505. If you upload your projects on social media, go ahead and use the hashtag #ctd505 and #colorthrowdown. You can find us on Instagram (and on Facebook!) with the username colorthrowdown. Before you get started, here’s some inspiration from the talented Color Throwdown team, our August Guestie Joy Taylor, and this week's Guest Star Stamper, Shana Gaff. Aw, what a fun image your have here - and such pretty color! Looks great in our tilty sketch! Thanks so much for playing at Sunday Stamps!